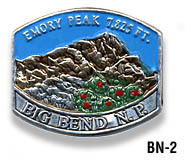 Emory Peak, located in Big Bend National Park, is the highest peak in the Chisos Mountains. and the highest in Brewster County. The peak is named for William H. Emory, the chief surveyor of the U.S. Boundary Survey team of 1852.